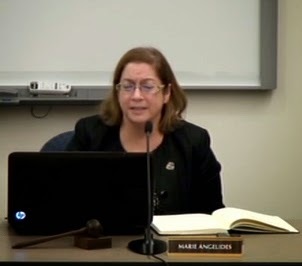 This following letter was submitted by Marie Angelides, Chair- Longmeadow Select Board. We are now about half way through Fiscal 14 and just over six months into my term as Chair of our town's Select Board and so it seems like a good moment to review where we are as a town. We all know that talk about casinos has dominated the public discourse and the media, but the Longmeadow Select Board has been working on many other issues as well. As the executive board of Longmeadow's public finances, one of our most important duties is to improve the fiscal health of the town. We approved the Finance Committee’s recommendation to adopt the GFOA (Government Finance Officers Association) standards for budget presentation. The Select Board is now reviewing and adopting new financial policies as required by GFOA. I believe the GFOA standards for budget presentation is an important step not only in fiscal reform, but also in increasing resident participation in the budgetary process. The new transparency in our budget will encourage debate among all our citizens. It is truly a win-win improvement and I want to thank the Finance Committee for their leadership in this matter as well as Town departments for the extra work needed to implement the new policy. Our auditors have emphasized the importance of developing policies and programs to manage our retiree health plan (OPEB) and pension costs. These are large unfunded liabilities, meaning that every dollar of these costs will have to come out of our pockets in one way or another. These expenses have been accruing every year for many years, and we are just now beginning to put money in a fund through a line in the budget. Our balance for the OPEB fund is $533,000. The Select Board policy would fund an additional $113,000 for FY14. Funding retiree health insurance obligations is a serious problem for communities throughout the United States, and it will certainly be an enormous burden for us until it is resolved. This year, I am proud to say we have seen the fruition of our work to decrease retiree health costs. In some cases there is a drop as high as 25% in the health insurance costs of town workers and retirees. Savings to our retiree healthcare costs are over $125,000 this year and our OPEB liability should therefore be decreased by millions over time. This is a good start, but more needs to be done. Ultimately, though, the long term solution to these unfunded liabilities has to come from the State Legislature. In recognition of this, the Select Board worked with the School Committee to advocate for reforms in retirement and healthcare funding at the state level. Long term fiscal health only comes if we all work together as a community. As Chair I scheduled joint meetings between the Select Board and School Committee as well as administrative meetings with Town and School personnel. These meetings have improved communication between the two sides that administer our town budget and have improved the budgetary process. In addition to budgetary matters, our two groups worked together on special projects. The first joint project was participating in the Wounded Warrior Run. This was a very special day in Longmeadow. Not only did Longmeadow raise over $15,000 to benefit the Wounded Warrior Project, but we celebrated Veteran’s Day as a community. It had been years since there was a Longmeadow Veteran’s Day program. The Wounded Warrior Run brought together the whole town for a landmark day that will become a new tradition in our town. I want to commend the organizers, the volunteers, and town employees for an amazing event. When it comes to improving the fiscal health of the town it ultimately comes down to dollars. We need to increase our non-property tax revenue and decrease our costs. With the help of our dedicated staff we have seen an increase in revenue from our wireless tower contract and we will realize savings from negotiations with our solid waste disposal contractors. The Select Board has been reviewing the fees and fine schedules of the town. Some of these fees had not been changed in years. We adopted new fee schedules that bring us in line with other surrounding communities and thus increased revenue. The town voted to become a Green Community. I would like to thank the work of the Green Communities Committee. This designation comes with a $155,000 grant this year and potential for $250,000 in grants in subsequent years. The Select Board has chosen the project advocated by Mark Gold to purchase and convert street lights to higher efficiency units. The potential savings of this project could be up to $80,000 a year. The Select Board is discussing putting some of those savings into a fund that can be allocated to the next project devoted to decreasing energy costs, thus multiplying those savings. We need to enhance our efforts to apply for grant money. Our departments have been applying for grants successfully for years. I believe that the Select Board and town committees should also seek out grants that may be available in their relevant fields and apply aggressively. This fall I applied for, and am a finalist for a grant to encourage participation in town government. During the casino forum, for example, we had a “live stream” feed for residents to watch the forum on their computers. We had more residents following the forum on their computers than attending the meeting! I hope to use the grant to purchase equipment that will allow us to offer “live stream” feeds for other forums and projects. Longmeadow needs to work harder with our legislative delegation to bring dollars back to Longmeadow. I have met with Senator Candaras several times to discuss projects in town that could use funding. With the help of the Town Manager we have made a request for funding of our water/sewer projects under a new bill that is now before the State Senate. We cannot look only to the Statehouse and the property tax base to pay for the needs of the town. For example, this past July we opened the Fire Truck Fund to private donations. There are many buildings at Bay Path College, the Jewish Nursing Home, Glenmeadow, as well as the new high school that could need the support of a ladder truck during a fire. We had a fire this year in Longmeadow that required a ladder truck. It took 20 minutes for a ladder truck to arrive from a neighboring town. Longmeadow needs a ladder truck, but these vehicles are very expensive, costing up to $250,000 more than a regular truck. The Select Board is looking to raise funds throughout the community and community organizations in order to decrease the wait for the purchase of this important piece of equipment. And now we turn to the casino. The Select Board, Town Manager, special counsel, consultants, and employees have worked tirelessly for months to negotiate with MGM and prepare for a presentation to the Mass Gaming Commission. The MGC is the ultimate arbiter of our relationship to any casino built in our area. I appreciate and am proud of the collaborative work of all involved. We will keep working to achieve a fair and equitable solution to our negotiations, and to make sure that Longmeadow receives its due share of mitigation costs. Thank you for your many messages of support as well as advice. I know I speak for the Select Board when I say we have been honored to serve you.